In an unexpected twist, I fell in love with the Steak & White Cheddar Panini at Panera Bread. See, I have another “go-to” sandwich but when I was out with a friend, I followed her lead. Yeah, I’m a rule breaker these days! A rebel! It was so good, I’m glad I got out of my “rut” and I recreated it here, for you. 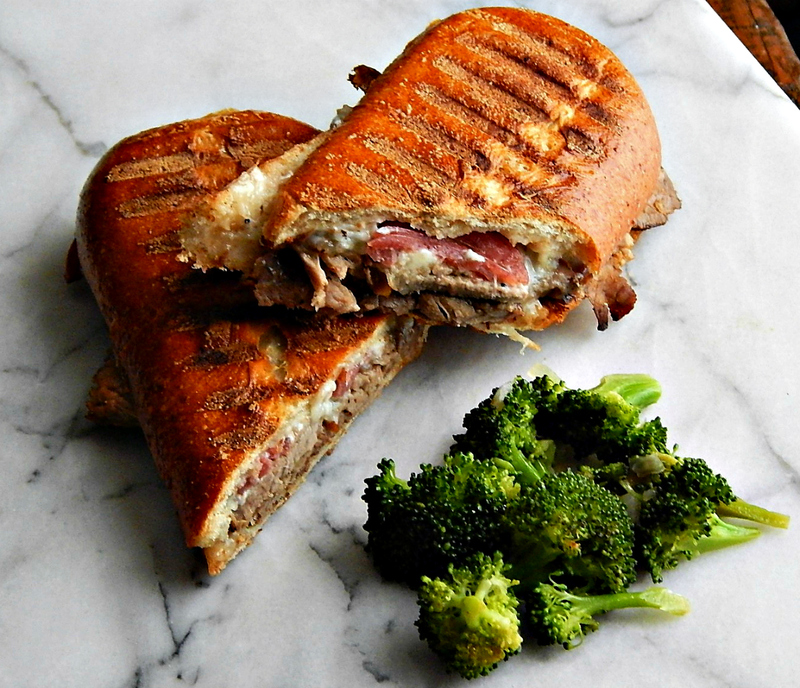 So here’s my Copycat Panera Steak & White Cheddar Panini. The funny thing about this Copycat Panera White Cheddar & Steak Panini is that when I ordered it at Panera, I didn’t really look through the menu. I usually order Panera’s Turkey & Artichoke Panini, so I didn’t know until later that my old standby had been taken off the menu. That was probably for the best, because I needed to grieve when I found out. Alone. I worked through that grief and recreated that Turkey & Artichoke Panini, too. So now, you are covered with two different Panera sandwiches. Panera describes their Steak & White Cheddar Panini as “Seared steak, pickled red onions, Vermont white cheddar and horseradish sauce all grilled on Artisan Ciabatta.” It all sounds pretty simple but the flavors, all together are just outstanding. And while it might sound like a lot of “sharp” flavors with the red onions, sharp Cheddar and horseradish, it’s not. It’s really a nice combination. Especially in a Panini. I do love a good Panini. What is it about pressing all the ingredients together and heating them up that makes those sandwiches so good? Well, part of it is the beautiful texture of the bread and that warm toasty crustiness, but the rest…maybe magic? Of course, it seemed the perfect thing to make Copycat Panera Steak & White Cheddar Paninis with my friend Rosanne when she came over for a day of cooking. It was just right, seeing as she’s the one who introduced me. Best of all, Rosanne stopped by Panera on the way here and picked up the actual Panera rolls. How’s that for a great friend? If you don’t have a friend like mine, don’t have a Panera or don’t want to buy the rolls, look for a nice Ciabatta, a good hoagie type roll or French rolls will work, too. Other than the beef, the rest of the sandwich is really about assembly. You can go homemade or store-bought on some of the ingredients. You can make or buy your Pickled Red Onions. I always have a jar in my fridge because I use them a lot, they’re so easy & they are the perfect thing to use up the rest of that Red Onion you might have left from something else. You can buy or make your Horseradish Sauce. I have a recipe for Horseradish Sauce, too, but we bought ours. Cut the recipe way back if you make it; you just need a little for the sandwiches. The beef, though is a bit of a different story. I suppose you could buy it from the deli, one of their roast beefs and just have them slice it a bit thicker than usual, about 3/8ths of an inch thick, but for me, that’s a bit pricey. But if you’re going to cook your own beef for your Panera Steak & White Cheddar Panini, it can made with just about any steak or roast. This is an ideal recipe to use a little leftover steak in, and an ideal one to cook a little extra steak just so you have enough to make this sandwich. I chose to use the 30 Minute Roast Beef I made in my Instant Pot. I keep sayin’ it: I love my Instant Pot! If you don’t have a Panini Press, grill your sandwich in a pan, cast iron is great, and add another pan on top. Weigh it down with a big can of tomatoes or something else that’s heavy. Easy peasy!n I usually put a layer of foil between the top pan and the bottom of whatever pan I’m pressing with just to keep things nice and clean. I have a gas stove so the bottoms of my pans are never pristine. So now, fess up! Do you go to Panera, and do you have a “go-to” item that you order? Something you can’t live without? My old fave? The Turkey Artichoke Panini. (Please don’t tell it I’ve been cheating!) Update: that sandwich has been discontinued! Here’s my Copycat Panera Turkey Artichoke Panini. I’ve always been a fan of Panera’s but there is no doubt that like so many restaurants, they’re getting pricier. I might have to do more copycatting! The best way to save money on your Copycat Panera Steak & White Cheddar Panini is to not be too particular about getting the exact ingredients and make a loose interpretation. While it was fun to make these with actual Panera rolls, that isn’t the cheapest way to go – although it wasn’t as expensive compared to the actual sandwich. And of course, the beef you use is going to make a big difference. Using a small roast saves a lot of cost over using steak. You can buy roasts from rump to round to sirloin, all for the fraction of the cost that you can buy the actual steak (from the same part of the animal) for. And it doesn’t seem to matter if you are going for a grocery store or butcher beef, the roasts all seem to be less per pound. I think it is probably cheaper to buy a little jar of horseradish that you can mix with some mayo rather than a bottle of actual horseradish sauce. The jars of prepared horseradish usually keep for a good long time in the fridge and then you can use them to whip up a little horseradish sauce as you wish, without worrying about it going bad. And of course, the red onions are a pittance to make. Assemble sandwiches: Slice rolls, horizontally. Spread the top side of the bottom roll with horseradish sauce. Add the beef, then cheese and top with pickled red onions. Close sandwich. Place on panini press and grill until sandwich is heated through or alternatively, place in a heavy pan over medium-high heat, weighing down with another pan, using something heavy in the top pan to add additional weight. This entry was posted in Click here for Bargain Meals, Click here for Fabulous Food Posts and tagged Beef, Cheese, horseradish, panera, pickled red onion, roast beef, Sandwiches, Steak, white cheddar. Bookmark the permalink. I’d absolutely love to take these panini for lunch tomorrow 🙂 Hope to get a chance to try them sometimes because they look fantastic! I must have missed some of my comment notifications, and again, sorry for the late reply! I’m not a huge sandwich eater but I do love paninis. They just elevate the whole grilled cheese idea! Hi Mollie– this looks awesome– and my favorite photo is the beef!! Just the right amount of pink and it looks so juicy and flavorful! And– thanks for the tips about the red onion!! My favorite Panera treat is a big pecan sticky bun and a mug of tea! hugs friend! I haven’t tried the sticky buns because I always seem to get those little baked souffle things they have. See…it’s a rut! Next time I’ll try the sticky bun! Oh! Those little puffy egg tarts?? delish. I love French Dips and made them, too!! These were really good, though! Maybe I should have made them into French Dips and served them with the au jus! I’m always about trying new restaurants and places I’ve never been but as far as a chain, I think Panera does a pretty good job. It looks good, Mollie! I do enjoy Panera bread, though I haven’t been there for a while! They’ve changed things up since I’ve last been there. I had an ancient grains salad as a side and it was good, too.